Sterling silver bangle, made and hallmarked to order. Please state bangle size on order page. 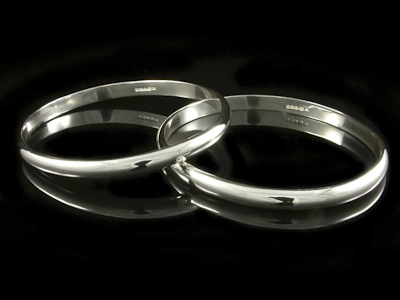 Just like the matching rings, these bangles ooze simple, timeless elegance. I don't generally have one of these in stock and, although I can generally make one within a couple of days, I have to allow plenty of time for hall-marking, so it could take as long as 3 weeks. If you need one in a hurry, check with me first. Alternatively, I can make one for you in what I will describe as white metal (and which would not therefore need hallmarking). Price for one of those would be £65. (Tell me and I'll issue a refund for the difference).